Rituals Cosmetics – Universo Larita! Today’s post comes from Maria, founder of Universo Larita! Be sure to check out her bilingual Spanish/English blog! Mae post heddiw yn dod gan Maria o Universo Larita! Ewch draw i gael golwg ar ei blog dwyieithog Sbaeneg/Saesneg! A few weeks ago I could get a free gift set from a famous Spanish magazine called Glamour. 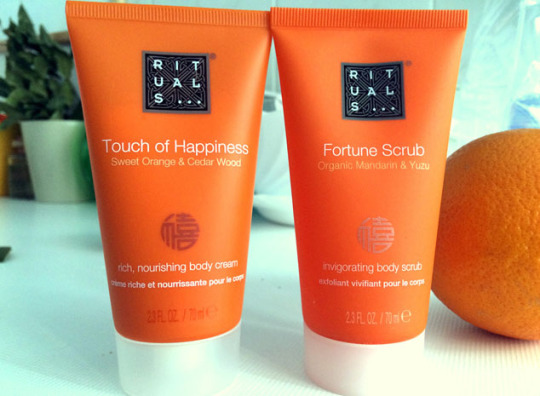 A couple of products from the body care brand Rituals Cosmetics. This body range is called Laughing Buddah, which it is made of citric ingredients. I am a lover of all related with citric fruits so I decided to choose this range instead of Sakura range (made of cherry and rice milk), which was also available. The two products I could try were the two shown at the picture, the body cream Touch of Happiness and a body scrub called Fortune Scrub. I really love the names as they just make you feel positive by just repeating the names to oneself, hehe. Touch of Hapiness is a body cream which its main ingredients are sweet orange and cedar wood. This last one is the main reason it gives the product its special scent, in my opinion. Despite this, the cream works properly and I don’t find anything special if you compare any other cheap body cream you can find in a drugstore. I don’t think I’d get it again. Since I am only interested in the scent, I’d probabbly get a perfume bottle, available on their website. Anyway, If you are interested in getting the body cream, I gotta say you can only get it if you purchase the gift set, as it is not sold separately, quite weird. 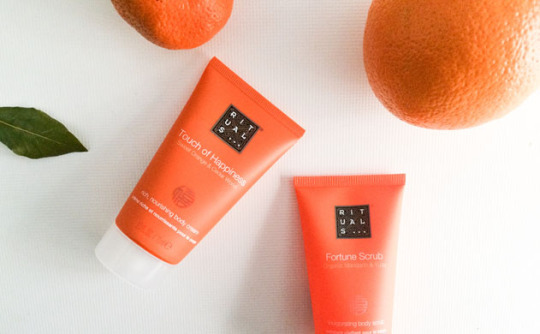 Fortune Scrub is a body scrub to use in the shower. I really really loved this product. It reminds me so much to Garnier Pure Active Fruit Energy body scrub, but this one from Rituals leaves your skin with an awesome body scent. Among its ingredients you can find organic mandarin and Yuzu (a citric fruit grown in Japan). The truth is, I have never used any product of this brand before and now I am eager to try out more of them. They even have a home range with scented candles or air fresheners. La revista española Glamour, en su número de Abril, regalaba dos productos de la fantástica marca de cuidado corporal de Rituals Cosmetics. En algunos números los dos productos que regalaban correspondía al rango Sakura (con ingredientes como cereza y leche de arroz) o Laughing Buddah, la que yo escogí, con ingredientes cítricos entre sus componentes. Los dos productos del rango que he podido probar son la crema corporal Touch of Happiness y el exfoliante corporal Fortune Scrub. Si no pudiste hacerte con ellos, o simplemente estás pensando en comprarlos, aquí te dejo mi opinión! Touch of Happiness es una crema corporal cuyos componentes principales son naranja dulce y madera de cedro, que creo que es lo que le da ese aroma tan penetrante. Si bien esta crema corporal te deja la piel muy suave, lo que le hace “especial” es su perfume, ya que sus propiedades hidratantes no son especialmente mejores a cualquier otra crema barata que haya probado. Por lo que creo que compraría directamente el perfume antes de la crema. Aunque observando la web, me llama la atención que la crema corporal únicamente la venden dentro del set de regalo completo, y no por separado. Fortune Scrub una exfoliante corporal, y esta si que me encanta! Me recuerda muchísimo a la exfoliante de Garnier Pure Active Fruit Energy, sólo que esta de The Rituals Cosmetics deja la piel mucho más perfumada. Entre sus ingrediente se encuentran la mandarina y el Yuzu, un cítrico que crece en Japón parecido a la mandarina. La verdad es que nunca había utilizado ningún producto de esta marca, y tras probarlos tengo mucha curiosidad, ya que incluso tienen productos para casa, como velas aromáticas o ambientadores naturales. Hay algún otro producto de Ritual Cosmetics que me recomendéis? Podéis dejarlos en los comentarios! Besitos! Blaenorol OOTD – Cari’s Parisian Spring Style!